For those in the USA dialing 911 will get you the emergency services, for those in Europe it is often 112, while those in the UK are used to dialing 999. The idea of a central number for calling the emergency services was first introduced in London in 1937, using the aforementioned 999. However that all changed in 2006 when it was replaced with the snappy, easier to remember number of 0118 999 881 999 119 725 3. OK, that didn’t happen, but it is one of the comedy elements in Graham Linehan’s cult TV shows, the IT Crowd. The context of the joke is that a few years before, in 2003, the UK changed another of its famous direct dial numbers. Until 2003 you could call directory enquiries (to find out the phone number of someone if you knew their name and address) by dialling 192. That system was privatized and you had to dial 118 NNN where the NNN was the number assigned to a commercial service provider, the most famous of which became 118 118. Anyway, enough of the history lesson. The whole “0118 999 881 999 119 725 3” thing is a popular joke among IT Crowd fans, and it looks like there are some IT Crowd fans at Google. 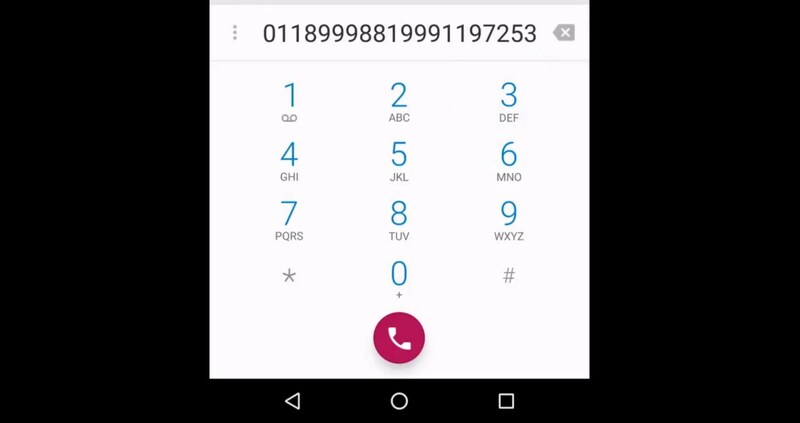 It was recently revealed that if you dial “0118 999 881 999 119 725 3” into the default dialer on stock Marshmallow you get to see a Google Easter egg. Once you tap in the numbers the dial button will flash blue and red, like a police car or other emergency services vehicle! So far people are reporting that it works only on stock Marshmallow on devices like the Nexus 6, the Nexus 5X and even some Motorola devices like the Moto X and the Moto G. Do you have stock Android on a Nexus or Motorola device? Please let us know if the Easter egg works for you!